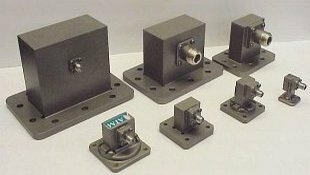 ATM manufactures Waveguide to Coax Right Angle Adapters covering the entire frequency range for Rectangular Waveguides and Double Ridge Waveguides, with multiple flange and coaxial connector types and configurations available. 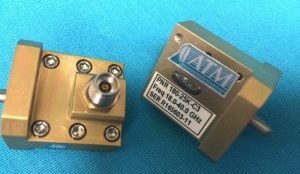 We offer Standard Full Band Models and Precision Low VSWR Models with SMA, Type-N, K-Type, 2.4mm, 2.9mm, TNC, SC and 7/16" connectors. 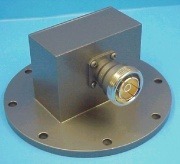 We also offer a line of High Power Waveguide To Coaxial Right Angle Adapters here. For more information feel free to call us and discuss your needs for Waveguide to Coax Right Angle Adapters with one of our design engineers. Other connectors such as SMA (M), Type N (M), SC, TNC, and 7/16 available. Consult factory for details. Pressure seal Units: Units sealed to hold 10 psi. Add "/PT" to model number. ** All data given at 20° C and sea level. ***Theoretical Insertion Loss for WG to coax adapter is difficult to measure due to the very low loss and setup. The max I.L. figure quoted is based on the theoretical losses due to connector, waveguide and reflection all taken at the highest Freq. and max value. **** Outline drawings are of listed model numbers. Other flange types may affect size of the components. Contact factory for optional flanges and dimensions. *The Standard Model Numbers above are the most common parts ordered for size, material and flange. However, these models can easily be altered for your needs by using the Model # code system at left. **Theoretical Insertion Loss for WG to coax adapter is difficult to measure due to the very low loss and setup. The max I.L. figure quoted is based on the theoretical losses due to connector, waveguide and reflection all taken at the highest Freq. and max value. ***Outline drawings are of listed model numbers. Other flange types may affect size of the components. Contact factory for optional flanges and dimensions. *** Outline drawings are of listed model numbers. Other flange types may affect size of the components. Contact factory for optional flanges and dimensions. Waveguide To Coaxial Right Angle Adapter - 7/16"
** Outline drawings are of listed model numbers. Other flange types may affect size of the components. Contact factory for optional flanges and dimensions. • VSWR 1.25 or better typical on most models, low values available over narrow frequency. • Multiple Flange Types available. • Standard Connectors are SMA and Type-N. Others such as TNC also available, consult factory for details. • Double Ridge W/G to Coax adapters are manufactured in aluminum only. 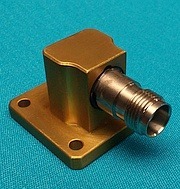 ** These units are supplied with 2.9mm (K-type) connectors only.